I live in a household with two diabetics, and they can’t always consume the same things that I do. Ideal No Calorie Sweetener allows for diabetics to have an alternative to sugar. Tastes so delicious it’s a Sweet Revolution™! And an easy way to reduce the amount of sugar in your diet. Today, more sugar is consumed in the United States than ever before. Obesity trends indicate that high sugar intake may lead to weight gain which is a risk factor for heart disease, diabetes, and cancer. ** Cut back on your sugar consumption by switching to Ideal® no calorie sweetener. Ideal® cooks and bakes more like sugar than the leading no calorie sweetener. Our granular blend measures cup-for-cup like sugar and comes in a recloseable bag. In addition to our white granulated sweetener, we also offer Ideal® Brown and Ideal® Confectionery. And one packet of Ideal® sweetens like two teaspoons of sugar, and dissolves like magic in hot and iced beverages. With Ideal® it’s easy—and delicious—to satisfy your sweet tooth without the guilt! For review, I was sent 100 packets of Ideal No Calorie Sweetener. Each packet sweetens like 2 teaspoons of sugar. This is suitable for people with diabetes. The difference is XYLITOL! Xylitol is a natural sweetener found in fruits and vegetables. Your body produces xylitol everyday. Xylitol looks, taste and dissolves like sugar in beverages, on fruit and in cereal. Clinical studies show that xylitol may provide health benefits. 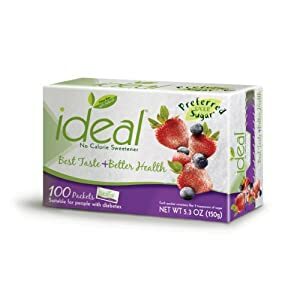 Ideal – 1 packet. Sugar – 2 teaspoons. Ideal – 0 calories. Sugar – 30 calories. Ideal – 1.5g carbs. Sugar – 7g carbs. It tastes just like sugar. I love that even though I’m not diabetic, I can still enjoy it without feeling like I HAVE to. You can use it JUST like you use sugar – on your fruit, with baking, and in your cereal. This is a must-have alternative to sugar!! You can purchase Ideal No Calorie Sweetener on Amazon, No Carb Connoisseur, and Netrition. One lucky reader is going to win Ideal No Calorie Sweetener for themselves!! Be a public follower of BBF via GFC. Submit each entry as a separate comment! Please include your e-mail address in EVERY comment! Visit Ideal Sweet, and let me know something you learned! (+1) – Follow Ideal on Twitter. (+1) – “Like” Ideal on Facebook. (+1) – Subscribe to Ideal on YouTube. (+1) – “Like” Beautifully BellaFaith on Facebook. (+1) – Follow Beautifully BellaFaith on Twitter. (+1) – Follow Beautifully BellaFaith on Google Friend Connect. (+1) – Follow my blog via Networked Blogs. (+3) – Subscribe to my blog via e-mail. (+1) – Comment on a non-giveaway blog post from the past month. Reviews are fine! (+5) – Blog about this giveaway! Please include a link to the giveaway…and a link to your blog! (+5) – Grab my button and place it on your blog! Please include a link to your blog! (+1) – Tweet about this giveaway. This can be done daily! Please include a link to your tweet! (+1) – Share this giveaway on Facebook! Please include a link to your post! (+1) – Vote for my blog on Picket Fence Blogs. You can do this daily! (+1) – Enter any of my other giveaways. One entry per giveaway. (+1) – Let me know where you found this giveaway. GIVEAWAY ENDS JULY 20TH AT 11:59PM (CENTRAL TIME). The winner will be chosen at random.org. I will e-mail the winner, and they will have 48 hours to claim their prize. Disclaimer: I received the above product(s) above from Ideal free of charge in order to facilitate an honest review. No other compensation was received. All opinions are my own. I learned that they make 0 calorie brown sugar, too! Love the Ideal sweetener! I went and got the coupon from the ideal site and learned where I can find it locally! I learned there are tons of places near me that I can purchase this. I learned that there is a recipe section on the website. There is a recipe for cream cheese frosting I'd love to try! Follow Beautifully BellaFaith on Google Friend Connect. I entered the Manna Organics giveaway. I entered the Oregon Chai giveaway. Thanks for the follow…I'm following you back…. I learned there is a Chef Ozzie cookbook with over 60 recipes. I follow you via GFC, as Jan Messali. I learned that Xylitol is not safe for pets, especially dogs! I follow Ideal Sweetener on Twitter! I like Ideal on Facebook! I like Beautifully BellaFaith on Facebook! I follow Beautifully BellaFaith on Twitter! I follow Beautifully BellaFaith via GFC! I subscribe to your blog via e-mail! I entered your Bling Strands giveaway! I follow ideal on twitter! I follow ideal on fb! I like bbf on fb! I follow bbf on twitter! You can use it in Ideal® Cream Cheese Frosting recipe. I entered the Green babies giveaway. 18 Week BUMPdate – Round Ligament Pain…Yay! How my Family Enjoys Movie Night with Netflix Families! I’m Moving in 3 Weeks! Ahhh!!! What are Your Good Life Moments?